Hello! It's time for a brand new Mojo Monday sketch (#262). Teresa has a great sketch for us this week, so I hope you find time to play along! I turned the sketch and made a vertical card. I used Doodled Occasions today. I just love this whimsical all-occasion set! I stamped the trio of flowers onto Kraft cardstock, colored them with Copic markers and added Swarovski crystals to the center of each flower. Accessories: A Cut Above Dies: Ribbon Banner Die, Pennant Trim Die (Verve); Standard Circle Nestabilities (Spellbinders), Waves and Bubbles Impression Plate (Taylored Expressions), Swarovski crystals, Button, Red twine (May Arts), Distress Tool (Prima), Foam tape, Thread, Sewing machine. Gorgeous creation, love the use of kraft and great colouring. loooove this! soooo cute and I adore those banners! This is such a sweet card and I love that pop of red against the kraft! Beautiful! 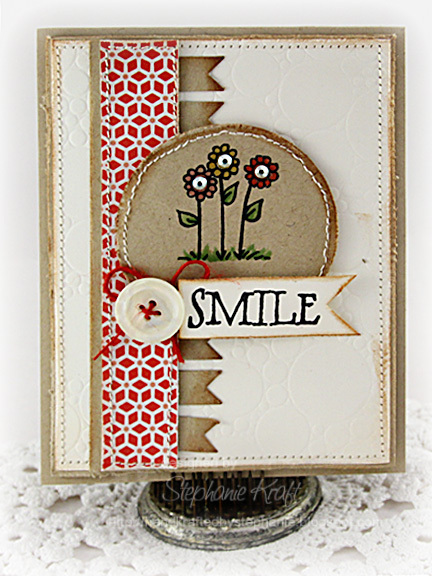 Darling card Stephanie! Love the sweet little flowers with the pearl centers! Love your take on this design! I have no clue why I never thought of flipping the sketch! Love it this way. The kraft coloured focal panel is great as are the touches of red on the banner die. Great take on the sketch! Oh, this is so cheery, Steph! Love it! this is adorable, luv those flowers...have a great week! Oh..I wanna play along with that sketch! I LOVE that you flipped it. Your card looks gorgeous! Very nice card! I love the colors!